‘Tis almost the season of giving, and my favorite things to do at this time of year are bake, bake and bake. Cookies, cakes, pies, muffins, breads… there are so many things you can bake and give. 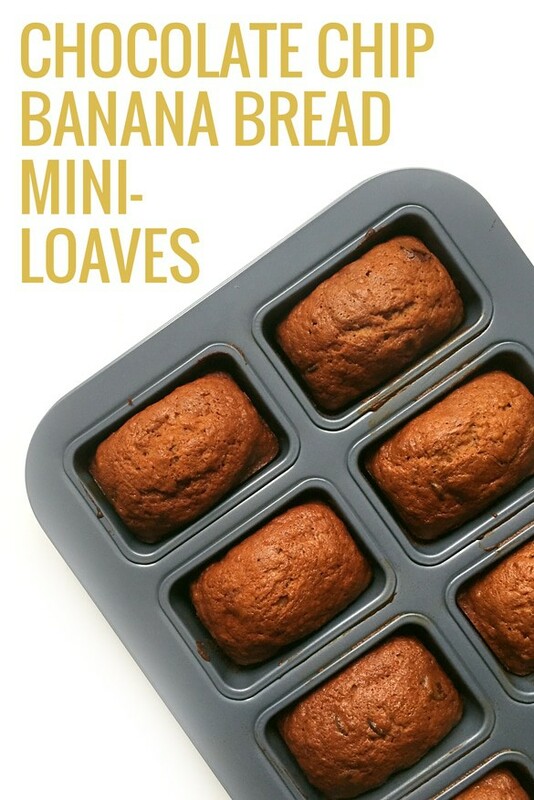 When I have a few overripe bananas, I love making a loaf or two of banana bread. But you can’t just give someone a half a loaf! 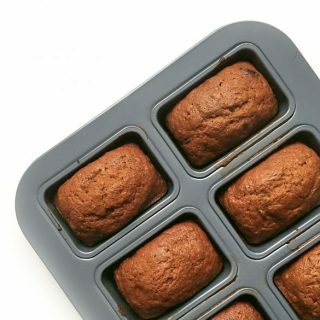 Enter this mini-loaf pan — the answer to holiday bread baking. 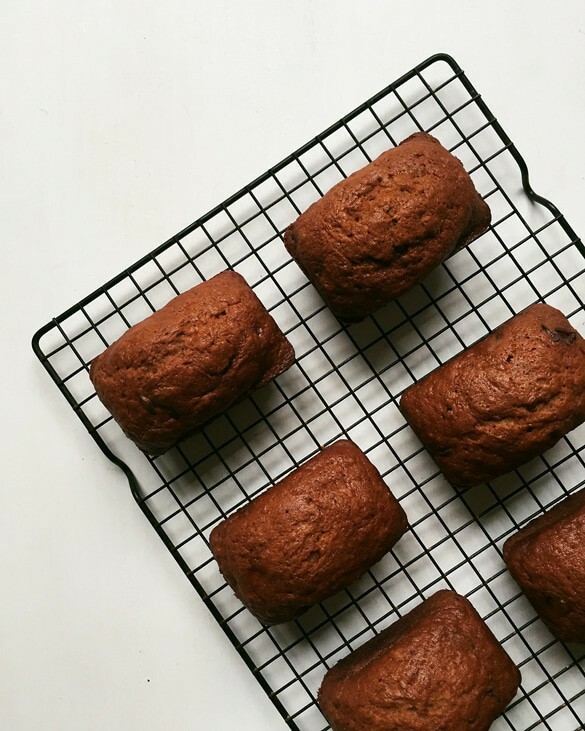 Make the same amount of banana bread, but evenly distributed to feed more people. I remember a co-worker who introduced me to these little loaves of heaven. She left two miniature loaves of pumpkin bread on everyone’s desk one morning. It was an easy way to eliminated break room freeloaders and appease everyone. So, I bought my own mini-loaf pan and it’s my favorite thing this time of year. After baking, of course. 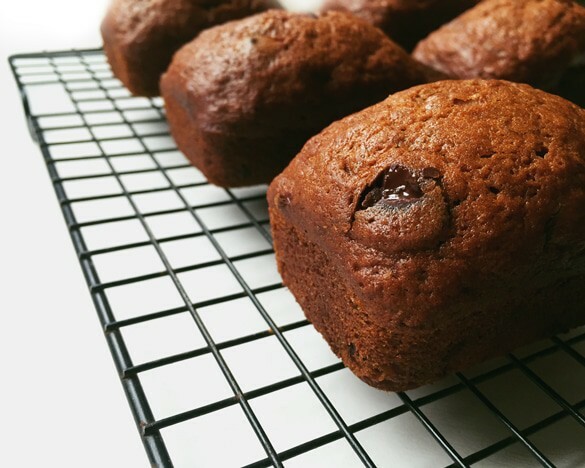 These Chocolate Chip Banana Bread Mini-Loaves are going to be a favorite amongst your neighbors, family and friends. Better start baking! Preheat the oven to 350°F. Butter a mini-loaf pan. In a large mixing bowl, mash the ripe bananas and melted butter with a fork until smooth. Mix in the sugar until combined. Beat in the egg and stir in the vanilla. In a medium bowl, stir together the baking soda, salt, flour and cinnamon. In three batches, stir the flour mixture into the banana mixture until combined and creamy. Stir in the chocolate chips until evenly distributed. Bake in 30 to 35 minutes or until a toothpick inserted into the center comes out clean. Cool for 5 minutes, then loosen the sides of the loaves with a knife. Transfer the loaves from the pans to a cooling rack and let cook entirely, about 2 hours. To store, wrap tightly with plastic wrap or refrigerate up to 10 days. Bake 30 to 35 minutes or until toothpick inserted in centers comes out clean. Cool 5 minutes. Loosen sides of loaves from pans; remove from pans to cooling racks. Cool completely, about 2 hours. Wrap tightly and store at room temperature up to 4 days, or refrigerate up to 10 days. 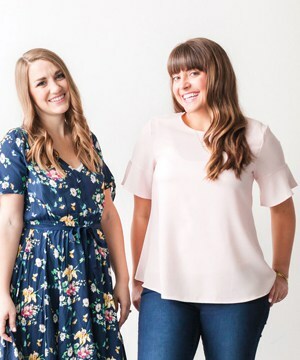 « Stocking Stuffer Ideas Under $10!